so, my ubercautious child who is the class crier in his gymnastics class (most of the other babies laugh when they do flips, etc; nate generally cries. it's awesome. ), anyway, my ubercautious child and i went to a new park today. 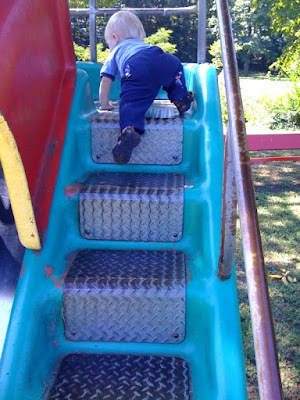 he straight up took OFF up these stairs and went down the slide all by his lonesome, laughing maniacally the whole way down. huh. i am too exhausted to post much more. i hope everyone enjoyed the gorgeous weekend. He is so cute. Is that a metal slide? Most all have been replaced here with the new playground equipment. 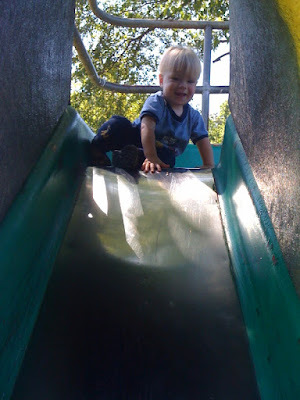 That's a big slide and an even bigger boy! Can't believe he just went for it. Where is that park at? We will have to go some time. Aww!! Hi Nater!! Mommy wow, he's a big kid now! hah! So cute. Can't wait to see him in a couple weeks!